One of reasons I started this company was to develop products that would benefit the most people vs. ego products that few can afford. The later of the two is btw, far easier in my opinion. The Zen Triodes are proof that I try to accomplish my missions. Based on their quality and sound they could have easily been repackaged in machined gold chassis and sold for top dollar in only the elitist solon's. So based on this mind set when the decision about what to do this year for a CD player came along the ZBox was an easy choice. To date I have done two CD/DVD players. The first DEC343 - a Pioneer player that I developed a tube output stage for. The second was the DEC685 - a Sony player that I developed a different tube output stage for. The only reason the second player came to pass is because they discontinued the first player shortly after I developed the mod. The reason the tube output stages were different is because one took it's signal just before the final output stage of the CD players original analog section and the other took it's signal off the DAC ahead of the original analog section. Well, almost a year to the day, the Sony player has been discontinued and replaced by a stripped out version of it's former self at just over half the cost. It's a real shame because both of these players made it into many happy customers hands with our mod's. In my eyes modding these players was a temporary solution to get a decent source in more of our customers hands. My hope is to develop a good tube DAC but these things take time. I've already done a good portion of the development on a DAC but as many manufactures will tell you we're in no rush with the current format wars. So the question became what to do in the mean time. Of course we'll still offer the mod's to both the Pioneer and Sony players but you'll have to supply the player. As I look around this year trying to find a decent player to mod, and dreading the R&D involved because I'll have to design two or three different circuits and listen to all of them, pick the most promising and then continue to voice it to my liking. This is a process that takes months. The new models of last years players are not getting better, only costing less money. None of them are real good candidates for a mod. At this point it looks like I would have to jump into the next price level to find a good candidate. I'm afraid after the mod's it would push past the 1000.00 mark - perhaps by a fair amount. This would take it out of the intended market, we would sell half as many units and by the time the year is up and I've recovered my development costs it will get discontinued. The ZBox is a stand alone device designed to become a tube cathode follower to the stock output stage of any CD player or DAC. It uses a single 12AX7 tube (dual triode) to accomplish this. The big question when comparing this approach to either of our two previous modded players is of course how will the end result compare? On the original Pioneer player my intension was to bypass the entire stock analogue output stage and feed my tube stage from the DAC chip. To make a long story short, it didn't work out that way. To keep noise low and maintain a robust frequency balance I had to use all but the last output stage in the original analog section to drive my tube stage. Having only eliminated one of the solid state op amps that make up the original output stage I was always amazed at how good the end result was. People who were used to listening to digital front ends costing $5000.00 were finding very little if anything wrong with it. On the Sony player, the DAC setup is a little different. Interestingly, the stock output of the Sony player had better sound than the stock output of the Pioneer player yet when it came time to apply the same circuit the end result was sub par. In the Sony the best sound was to change the output stage to a Plate driven output with gain and feed it directly from the output of the DAC chip. As you might expect the Sony player had a bit more inner detail than the Pioneer but did nothing else any better. Imaging and soundstage on both were excellent. I found the Sony to be a bit more analytical while the Pioneer was a bit more musical. This is not what I would have expected since I have so little respect for the surface mount solid state output stages in consumer players. I thought that these solid state output stages were basically futile. When you listen to them an compare them to a really good reference player you can hear how literally broken the soundstage and imaging are. You can also hear the frequency balance of the music change with the transients. Sudden swells or peaks in the music excite the output stage in a negative way resulting in notes that shout at you for no good reason. The fact that the Modded Pioneer sounded so good should have been a clue, but until recently I didn't realize you could actually fix to some degree the damage these cheesy little output stages create. In comparing the stock outputs of the original Modded Pioneer connected to the ZBox with the modded outputs of the player I was again surprised at how similar they sounded. The only large difference between the two is that the modded outputs have one less op amp between the DAC chip and the tube output stage. The voicing on each sounded almost exactly the same, except that the stock outputs driving the ZBox had a touch more weight. Applying the same test to the Sony player I expected a greater difference in sound and there was. The stock outputs feeding the ZBox had close to the stock output voltage, while the modded outputs had significantly more. The overall weight was better on the stock outputs feeding the ZBox than it was on the modded outputs. The modded outputs demonstrated the same increase in inner detail that we heard when we compared it to the Pioneer player. However, again the difference was there but not overwhelming. In this evaluation the trade off was some inner detail traded for a less analytical sound with more tone. Finally connecting the ZBox to the modded outputs of the Sony player was a noticeable improvement over the prior tests. This was a welcome result because I didn't design the ZBox to filter things and make crappie CD players sound better. Instead it was designed to have excellent transparency so that it would also make good CD players and DACs sound great. It's appeal should be to a wide market with both entry level players and heavy hitters benefiting from its use. Getting back to the guy with an inexpensive to moderate CD player or DAC... You will no doubt wonder if adding a ZBox to your present player would be more cost effective than having that player(DAC) tweaked or getting a new player(DAC). I've heard a lot of tweaked CD players and DACs. The upgrading of the internal power supplies, and choice replacement of parts in the analogue section make a big difference but not to the extent of simply adding a ZBox. The ZBox does wonders for opening up the music and developing a natural sound stage. It adds a wonderful sense of control and weight to the bass. It makes the mid's sound way more organic and liquid, and the highs shimmer without the grain or dryness. There's just no substitute for a good all tube cathode follower circuit. There are a couple of advantages to the ZBox approach that may account for results it brings about. It is after all a tube output stage that becomes a direct coupled cathode follower to any line level source. That means it has the ultimate low impedance output able to drive anything including long cable runs with the same consistent sound all the time. Its also stand-alone with it's own steel chassis offering total shielding of the output stage from the RF in the room and the Digital noise of all the chips in your player or DAC. It also has an earth ground via it's removable power cord. It has been designed so that when you plug your source (and amp) into it they also gain an earth ground, something that many CD players and amplifiers don't have. It also has a variable output via a simple to access control on the front. This allows you adjust the output of your CD player to match your preamp or become a volume control when driving an amplifier directly with no preamp. With many DACs having high output (over 2 volts) this allows you to tame it back down to a more usable 2 volt range without loosing the dynamics you picked up from having higher output in the first place. Finally, the tube itself is a huge advantage in that you can easily access it and replace it with your choice of over 20 different brands each with a slightly different signature. Some will be more dynamic, some more airy, some more focused, etc. You will have control over how it sounds. You can also use lower gain tubes such as 12AT7 or 12AU7 when you feel like seeing what happens on a high output DAC exceeding 5 or more volts. And while there are probably more, one of the last things that comes to mind is the fact that the ZBox is always on. It runs 24/7 so it develops a consistent temperature eliminating parts drift for consistent sound. It's always warmed up and ready at all times. The heaters of both halves of the dual triode tube are in series with 10 vs. 12 volts of AC. Slightly starving the heaters like this and series wiring are tricks I've learned along the way to both improve the sound and make the tube last twice as long. Since the tube never gets hot, you can grab it while it's on without consequence. For this reason it protrudes through the front of the chassis as if it were a knob, in fact it looks just like one. This makes changing tubes very easy to do without having to unhook stuff. It's my feeling that a guy with a so/so CD player or DAC (who's faced with purchasing a new one and expecting substantially better sound) may be able to spend less than half the money on a Zbox and get a better result. Then later when a new player is purchased the Zbox is used to elevate the performance of that new player to a level noticeably higher than without it. 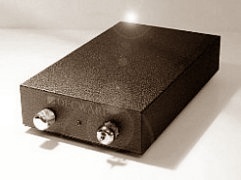 This is an all tube cathode follower that can be used after any line level device and or preamplifier. It has just under unity gain so what you put into it is basically what you'll get out of it. The ZBox is a device I've talked about making since the late 90's and now is the right time for it. This product is being built in a newly designed chassis with dimensions of 2"H x 6"W x 11"D matching the basic size of the original Zen Triode chassis so that it can be optionally slipped into a hardwood base like our amplifiers. Otherwise it will offer a clean stealth look with a high quality black powder coat textured finish. To preserve the karma the ZBox was designed with an analogue pencil and ruler.